1. Lake Superior University has once again published a list of words/phrases they think should be banished from the Queen's English...fiscal cliff, kick the can down the road, double down, job creators/creation, passion/passionate, yolo, spoiler alert, bucket list, trending, superfood, boneless wings, guru. Which of these words would you most like to see banished from everyday speech and why? While "boneless wings" really bother me (that's not real life! ), I'm going to have to say fiscal cliff. Ugh. If I never hear those words again that would be fine with me. Umm... this morning. To work. And it was not fun. I was dropped off at the metro by my mom, which was so lovely, but as soon as I walked into the station I see the huge crowd the red warning sign and I just know it's going to be one of those commutes. Fortunately I'm pretty tiny and can shove myself into even the most crowded train car so I ended up not being too late. Still not my favorite way to start off the work day. Yay. And I happen to love everything bagels, even though they make your breath not so pleasant. I also happen to really miss Einstein Bagels. My college had one on campus, open until 2am, and there was nothing better than a bacon/egg/cheese bagel at 2am to give you the extra boost to finish that paper or get back in the studio for an all-nighter. Harry Potter. Actually I kinda just really wish that movie was real life. I also think being in Gone With the Wind would have been fun- I love playing dress-up. I suppose this might be beneficial for some kids-although I feel sorry for any teacher with a classroom full of 20 middle school boys... actually girls might even be worse. I have friends who went to all girls schools or all boys schools so the option does exist. Personally I never had a problem with it and in the "real world" things wont be separated for them. So if I was a parent I don't think I'd pursue it. Not having to make the bed. And room service. I guess I kinda made "strong" my word for 2013. See post here. 8. Did I mention my mom is in town? I'm so excited she's here! I love that when I get off work today I get to hang out with her. She arrived last night and we went out to a really yummy dinner. 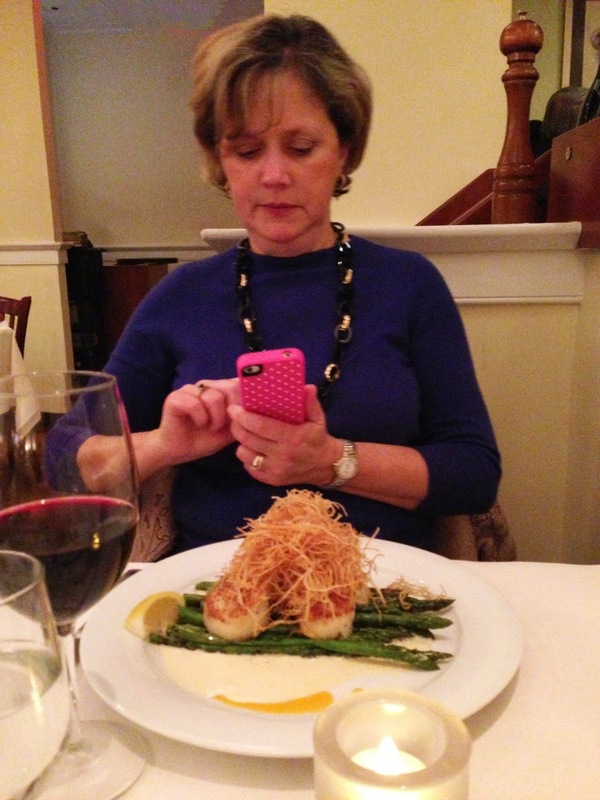 Here is a picture of my mom taking a picture of dinner. Clearly we are both bloggers. ok, I just saw this picture while wearing my glasses-I take back what I said : ) I'm pretty serious about getting that photo, aren't I? Also-don't you think I look just like your Aunt A in this picture? Oh, and I need to stop taking pictures and phone my hair stylist asap!! I'm going next week, but looking at the top of my head in this picture makes me think I needed to go last week! Well I think you look adorable! Just stopping by from the Hodgepodge. I enjoyed your answers, but I don't think I'd enjoy starting out my day with your commute! Funny photo of your mom taking a photo of dinner :) All bloggers think alike! Your picture cracked me up since it's the other side of the picture your mom put on her blog today. Hope you both enjoy your time together! Have such a wonderful time with your mom...Joyce is great! I chose Gone With the Wind to star in, but I think Harry Potter would be a close second! Your Mom posted a picture of her dinner on her post so it is fun to see her actually taking it. Too funny..... the picture and comments from your mom. Have a great time! Tell her hello! So cute :) You are so lucky. I wish I could have my mom here every day. She lives way across the country. She comes every few years. I try to go visit at least once a year.